I’m participating in a durational performance To Cross(Walking New York) by Anne Wilson at The Drawing Center as a part of the exhibition Thread Lines, curated by Joanna Kleinberg Romanow. The opening is on this Thursday, September 18, 6 - 8 pm. Wilson’s piece will not be performed at the opening, however, you will be able to see the progress we’ve made so far in the pre-opening performances as we will by then have been walking thread of varying colors (specific however) for many days amongst the existing columns of the main gallery, making essentially a site specific “wall.” It’s absolutely wonderful to be a part of this work with Anne Wilson, and frankly it’s gorgeous. The entire show is gorgeous actually and extremely thoughtfully curated. We’ve been walking the piece in the pre-opening performances while they’ve been installing the show and it’s been very interesting. As I said, no one is scheduled to be performing the piece during the opening night, but the thread wall will be present, of course, and my guess is that it will have been walked/woven to about my knee height…and it will be developing further until its over my head height, I believe (I’m 5'5’). As a durational piece, this will develop over the next two months. It’d be great to see you there at the reception and/or any performance times you’d be up for seeing. Please join us for the opening of Thread Lines and Xanti Schawinsky. In conjunction with the exhibition Thread Lines, on view in the Main Gallery from September 19-December 14. On view from September 19 – December 14, see performance times here. 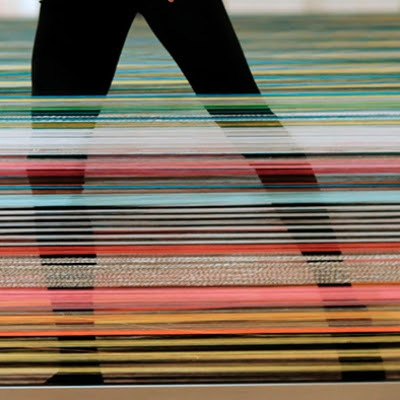 Don’t miss the site-specific performance To Cross (Walking New York), by Chicago-based artist Anne Wilson, that will use the main gallery’s four central columns as a weaving loom. The durational performance, which will take place over the course of two months, will result in the fabrication of a five by thirty-four foot sculpture. The exhibition admission ticket also includes this performance. © 2019 — Kate Harding. All images and copy are subject to copyright and may not be used without express written permission.